Ayala Malls Cinemas brings the world-class experience opera in the country, presenting operatic productions to a wider audience. Its debut feature on its third season, “La Donna Del Lago” tells about a time when Scotland under King James V (reigned 1513–1542) was in a state of unrest. Amongst the rebels were Douglas (Elena's father), Rodrigo (to whom she has been betrothed) and Malcolm (whom she loves). The King is in the habit of going about his lands disguised as Uberto. Seeing Elena he instantly falls in love with her, but she repels his advances stating that he is confusing hospitality and friendship for romantic interest. In the meantime he has realized that she is related to his enemies. The clans gather to overthrow the king, and Rodrigo and Douglas discover Elena's secret love for Malcolm. She tries to keep the peace, but the call to arms diverts the soldiers. The battle does not go well, and Rodrigo is killed. Again the king in disguise encounters Elena and gives her a ring to take to the king if she is ever in trouble. She decides to use it and goes to Stirling Castle where she finds that both Malcolm and Douglas are prisoners. She pleads their cases, and the king magnanimously pardons them and blesses the union, now unimpeded by Rodrigo, between Elena and Malcolm. Bel canto superstars Joyce DiDonato and Juan Diego Flórez join forces for this Rossini showcase of vocal virtuosity, set in the medieval Scottish highlands and based on a beloved novel by Sir Walter Scott. 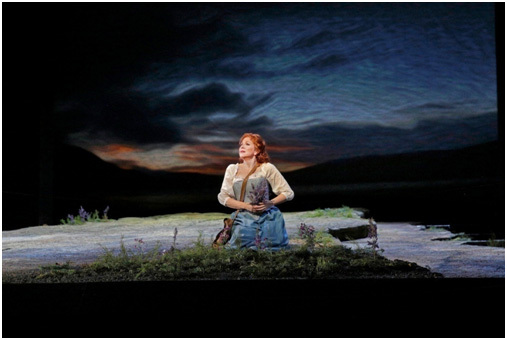 DiDonato is the “lady of the lake” of the title, and Flórez is the king who relentlessly pursues her, their vocal fireworks embellishing the romantic plot in this Met premiere production conducted by Michele Mariotti. Succeeding shows will be on January 12 (“Tosca”), February 9 (“Iolanta/Bartok’s Bluebeard’s Castle”), March 8 (“Carmen”), April 12 (“The Merry Widow”) and May 10 (“Macbeth”). Log on to www.sureseats.com for more details of MET OPERA IN HD SEASON 3 AT GREENBELT 3.